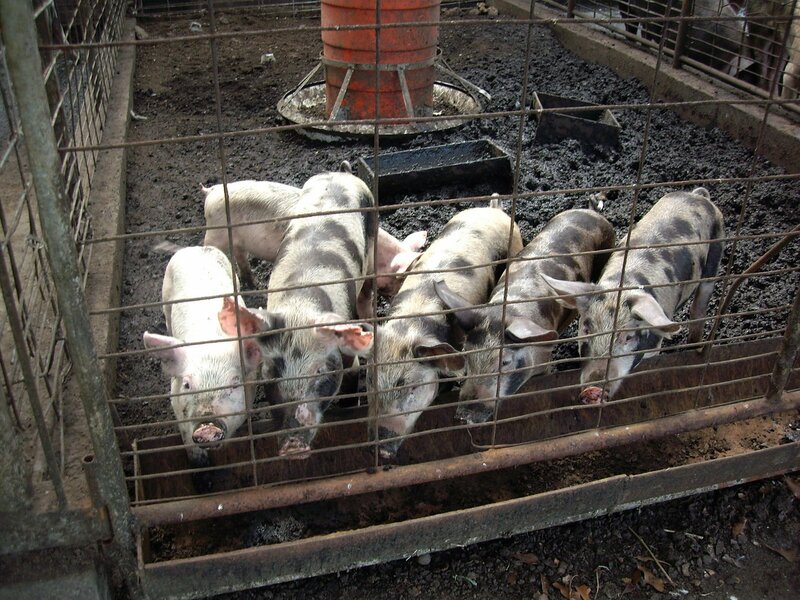 In several of my posts, I’ve referred to what I call my “pig dirt.” It is given to me by friends who have a piggery nearby. I knew it was rich and produced good veggies for me, but had never gone to see the source. 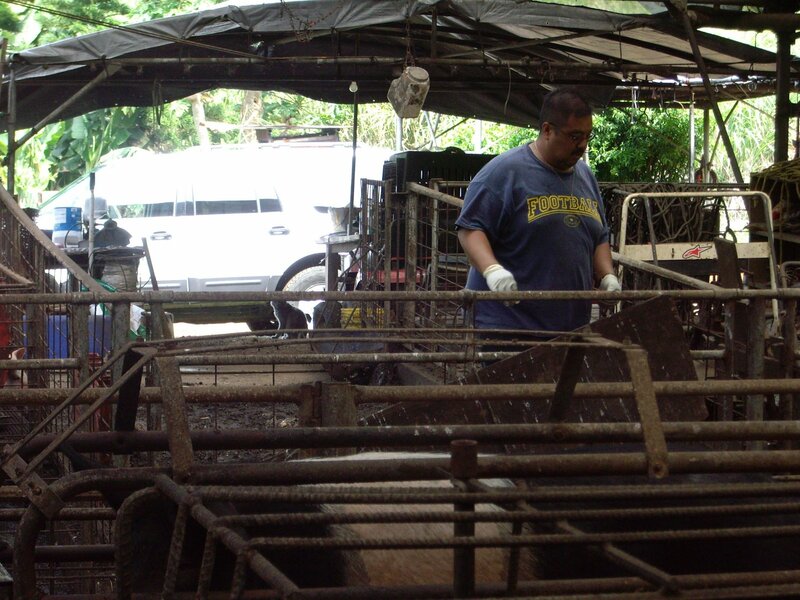 A couple weeks ago, I went with Dane and Terry Shibuya to their pig farm, mauka of Na`alehu. For the benefit of my readers who do not live in Hawai`i, we talk about the location of anything up the mountain from where we are as mauka. Everything that is below us toward the sea is makai. 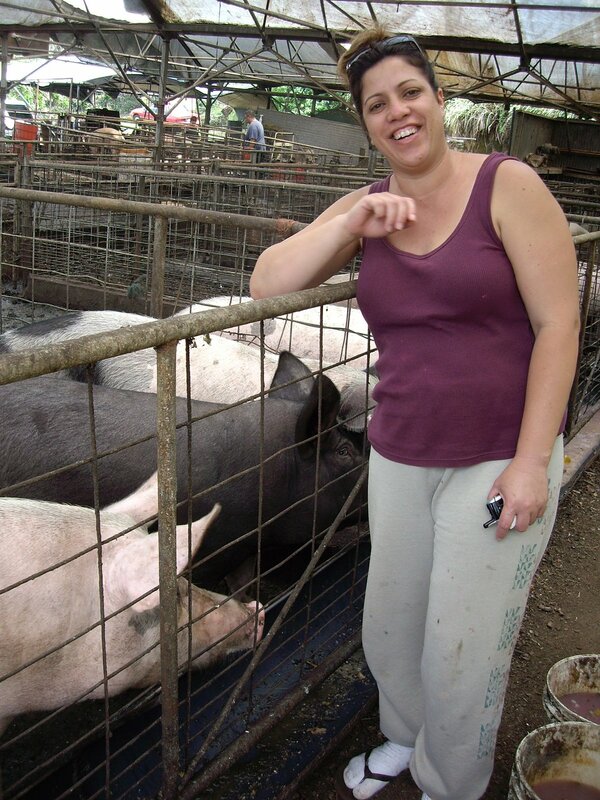 So we drove mauka a short distance over a dirt road from Na`alehu to “Masazo’s Pig Farm.” Masazo was Dane’s grandfather who originally owned the land that has been handed down through three generations, with a fourth generation in waiting. I was warned about the smell, but I honestly wasn’t bothered by it. It’s the smell of good manure that will become wonderful “pig dirt” for my raised beds. 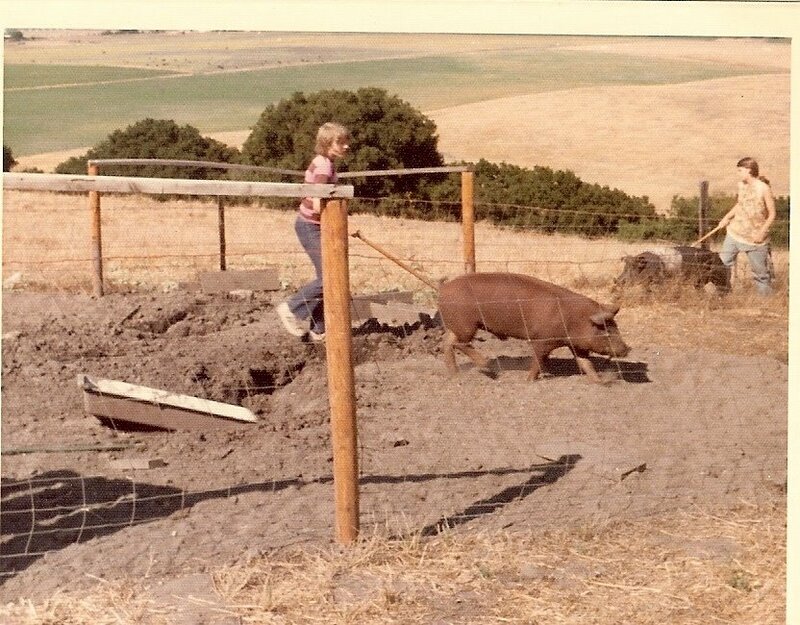 My limited experience with pigs was with two of my children who raised pigs for the 4-H club. Their dad and I were community leaders of one of the local 4-H clubs in California. 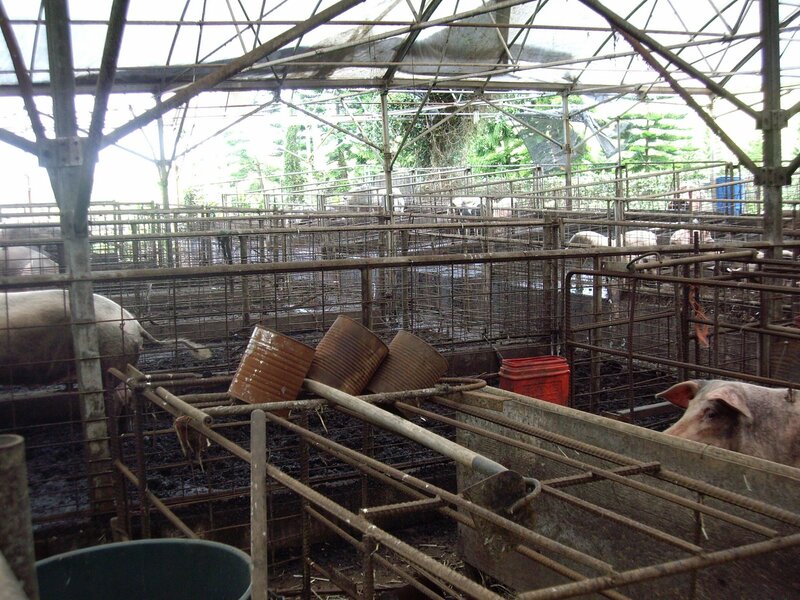 Even with only two pigs on our small farmette, I learned a fair amount about pigs. 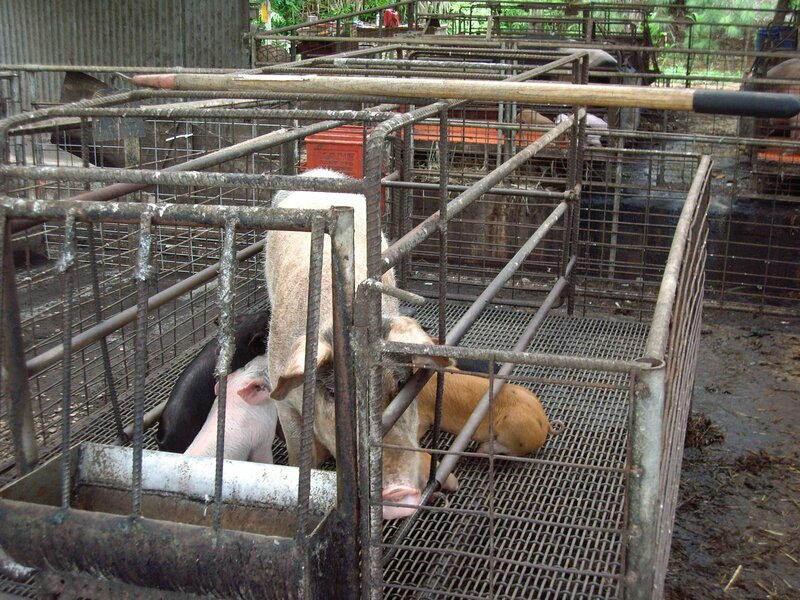 Here Mark and Inga are training their pigs to walk with a tap of the cane. 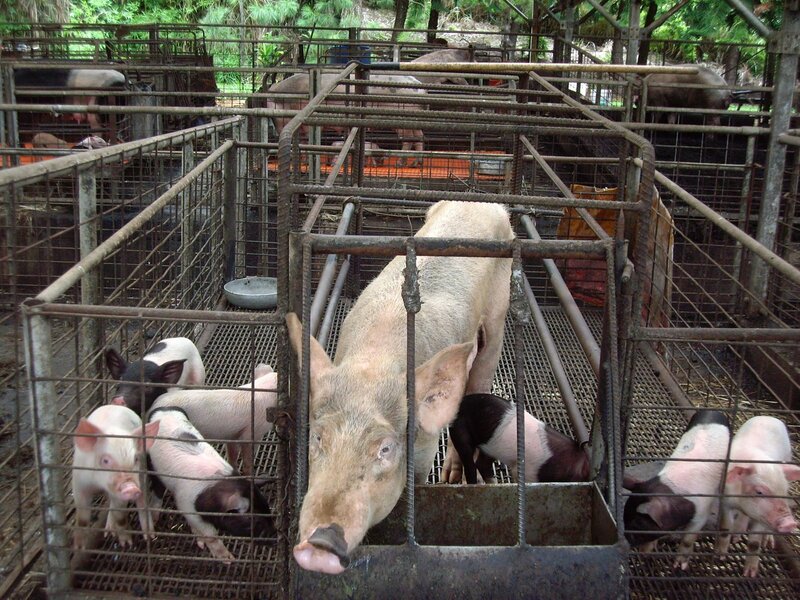 By the time the pigs got to the state fair for showing and judging, they were in prime condition, ready for market. I never knew pigs could be so smart! 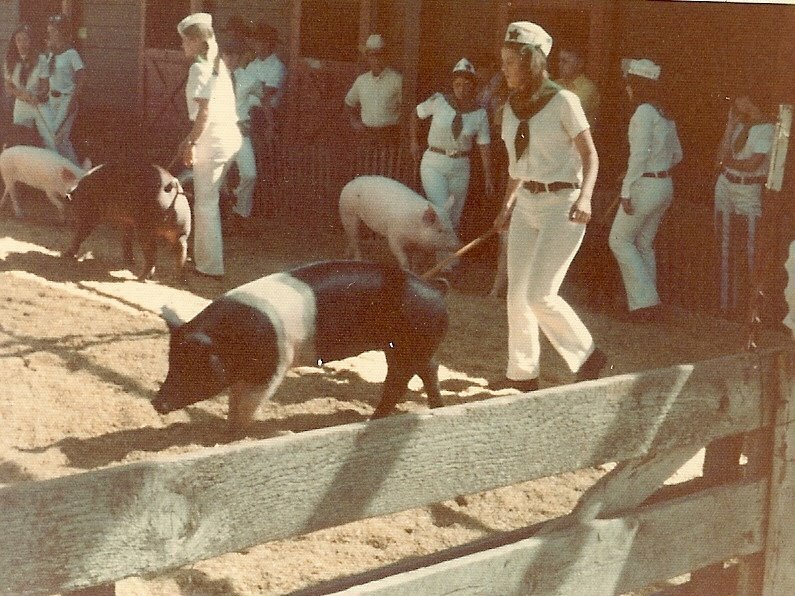 Here is Inga in her 4-H uniform showing her freshly cleaned, greased and powdered pig. There are two lines of stalls with a large “ditch” between them. The stalls slope toward the middle so that Dane can push all the manure into the ditch with his Bobcat. The gathered manure is then carried out to a yard area where it will be spread out to dry. 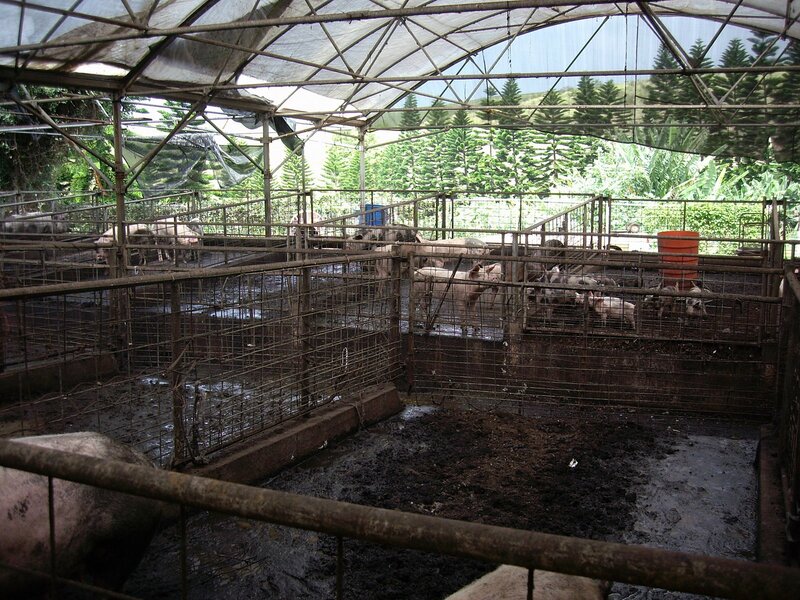 There are special stalls for the farrowing (birthing), to protect the babies and keep them cleaner. The mother can accidentally roll over her babies and smother them. The completed product has no smell whatsoever, and it’s what I have piled up in my side area here. He told me there was no soil mixed in with it, other than a little that might get scraped up in the process of gathering it. They suggested that I can mix it with a little garden soil and/or a bit of cinder, or even use it as it is. Any gardener needs to know about N-P-K. N (Nitrogen) is necessary for the rich, dark green vegetation that grows above ground. P (Phosphorus) is the element that produces strong roots plus any fruits or flowers. K (Potassium or Potash) helps to prevent water loss due to dry weather and cold air, thereby keeping strong plants. Depending on your purpose, the ratio of these three elements will vary. For instance, if you want a rich lawn, you’ll look for a fertilizer that is high in Nitrogen. If you want more flowers and fruits, then you want high Phosphorus. Another regulation I wasn’t aware of is that wild pigs are not allowed to breed with domesticated pigs. The Masazo pigs are protected from any wild pigs getting to them. After having four children (at separate times), I can sympathize with the Mama Pigs (sows) who have large litters of piglets. It takes three months, three weeks, and three days from conception to birth. The babies are weaned after about five or six weeks. 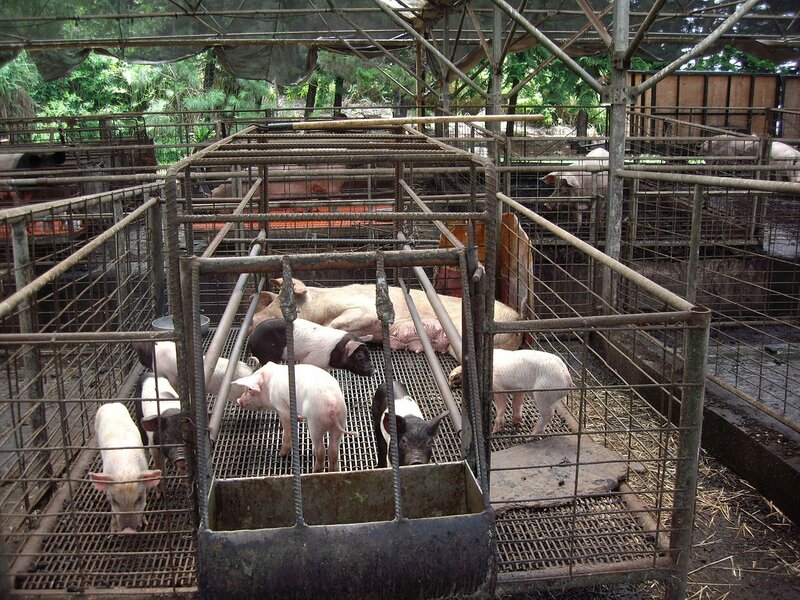 Three days after weaning, the sow is ready for breeding again and can produce two and a half litters per year. Even though the sow looks too lean for breeding again, Dane said the skinny sow makes the best babies, “just like a skinny wahine makes better babies,” he said. One of Terry’s friends will be going into my freezer soon! It might be more difficult to cook them, after seeing them at Masazo’s, but I think I can force myself! Many mahalos, Terry and Dane! You really know how to show a girl a good time. I’m envious of your pig dirt. I am a few weeks away from having my raised bed completed, and ready for dirt. Aloha! You can get compost ready-to-go at the Naalehu Transfer Station. I’m not sure how often it’s available, but it’s in a huge pile. You can either take a small pickup and get some or take large trash bags and shovel it in. The gate isn’t always open, and sometimes it’s all been taken, but check it out next time you’re there.